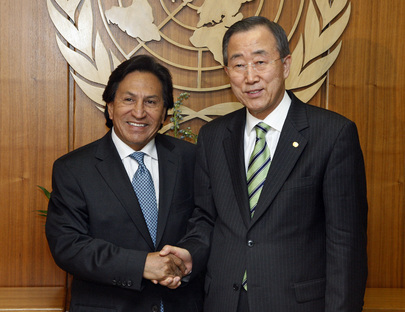 UNITED NATIONS, March 26 -- Former Peruvian President Alejandro Toledo, reportedly polling at 11% support in the run up to the 2011 election, spoke Friday at the UN in New York. Inner City Press asked him about his poll numbers and plans, including if he might join forces with the leader of the Partido Popular Cristiano, Lourdes Flores Nano, who polls lower at six percent. "I understand you are a journalist," Toledo began. "You do your job and I do mine. I am not a candidate, I'm sorry to disappoint you." He paused. "At least not yet." Toledo went on to describe his "heavy burden" as the first president elected in 500 years from "an Andean background... I'm concerned how to implement, how to change lives." Describing his life as a professor, he concluded that he'd "lost him mind" once moving from "academia to politics, I'm trying to be care not to commit the same mistake." Toledo was also asked, twice, about Venezuela's Hugo Chavez. Toledo contrasts a leader flush with oil money with one, implicitly like him, who tries to manage an economy correctly. He denounced the shutting down of media and arrests of political opponents. A representative of Venezuela's Mission to the UN ran out into the hallway of the UN's new Temporary North Lawn Building, clutching his cell phone. Later, a more senior Venezuelan representative, Ms. Medina, entered the room. She was given the last question of the UN University event. She chided Toledo for criticizing President Chavez without giving any notice to the Venezuelan Mission, calling this "cobardia" or cowardice. The audience, with many Toledo supporters in attendance, booed the use of this word, and urged the UNU moderator to cut off the question. But Ms. Medina continued, in Spanish, with the colleague who had called her providing a monotone translation. She said the Toledo had supported the coup against Chavez in 2003. While some argue that it was not a coup at all, Toledo when he responded countered that he had issued a press released condemning the attempt to oust Chavez. He conceded that for a time his popularity had sunk to 8%, but he said this was because he was not "managing for polls." Ms. Medina rolled her eyes. She said Toledo did not understand democracy. Afterwards, Ms. Medina was heard to say while in the UN coffee line that "there are going to be problems." It was unclear if this meant a complaint against UNU. She also told a journalist to be sure to report "objectively." Or what? Also after the showdown, sources say that Toledo's wife complained to the UNU moderator about the Venezuelan intervention, and ask that he deliver a short apology for the camera crew following Toledo. Some surmised a campaign commercial being filmed. At Friday's UN noon briefing, Inner City Press asked Ban Ki-moon's spokesman Martin Nesirky about the relation between UNU and the UN, and whether UN events held inside UN buildings implied that member states have the "right of reply" as they have in the General Assembly. 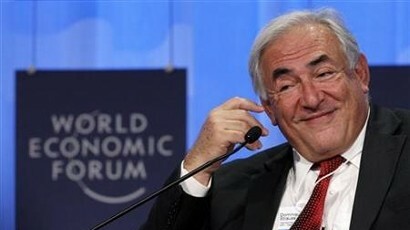 Nesirky said he'd look into it. Watch this site.